Keep your 30mm crankset turning over smooth and fast by upgrading to the Hope 68/73mm 30mm Bottom Bracket. The machined aluminum cups hold stainless steel cartridge bearings inside stainless steel races, providing a much greater life span than stock units. 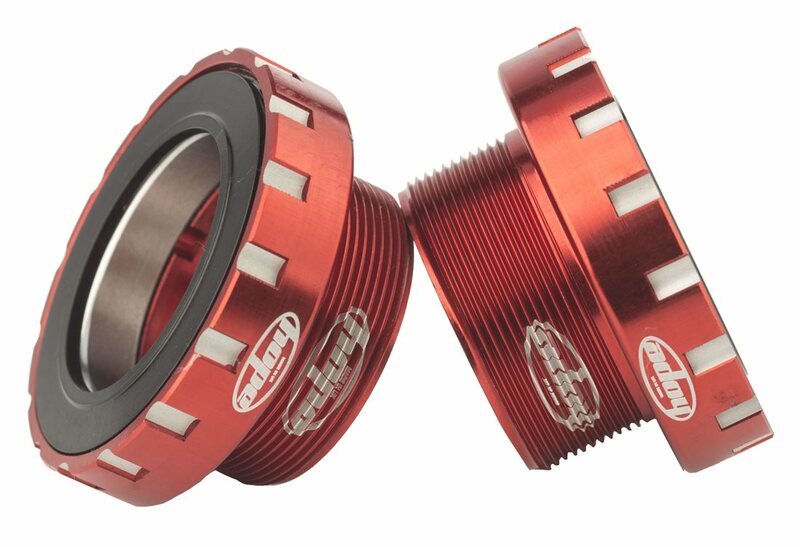 The Hope 30mm bottom bracket allows the use of any 30mm crankset within a BSA threaded BB shell of 68mm, 73mm or 83mm, meaning it can be used on select road bikes, mountain bikes, and downhill bikes. Please note specific fitting tool (available separately) is needed to fit bottom bracket. It is critical to bearing life that the frame is prepared correctly. Please follow manufacturer's instructions. Great bottom bracket for Hope's new rankset, but it requires Hope's HTT188 bottom bracket tool. Nothing else will work. Since the tool only seems to be available in England, I made my own on a waterjet. Great product, comes I. Different colors, decent price and better than the cheaper item that is needed for raceface specific 30mm spindles. Install is easy if you either have a hope B.B. wrench or auto strap wrench. I used a strap wrench which no torque indicator but worked! Great shop and the right price!This shop is highly recommended and you would definitely come back again. Best BB around for 30mm cranks. Run with my Turbine cinch cranks. Ran the raceface 30mm BB for 5 months before the bearings shot. Swapped to Hopes 30mm BB and it's been running smooth for almost 2 years, only replaced now for a 500+ mile backpacking trip starting soon (better to be safe than sorry). Just remember to get Hope's specialty 30mm BB tool for install/removal. Typically great product from Hope. Purchased these to compliment their cranks. Extremely smooth bearings and the fit and finish is 2nd to none. Highly recommend this product. I was sorely disappointed with the garbage RF 30mm BB that came with the RF turbines (xtype or some such). They siezed up on me with no mistreatment and very few miles. There were not that many options for external 30mm but there was no way I was going to give RF more $ for that crap design. Decided to try these and have been extremely happy. They are dead smooth and spin fantastic. Yes, I did have to spring for that goofy HTT188 proprietary tool as well but it was worth it. These are a major upgrade if your running turbines. Debated between this and chrisking. And I am not disappointed. Just as smooth and looks even better! I installed this in my Banshee Rune with 73mm BB shell. It had the RaceFace BB and it lasted ~6 months. Installation was super easy using the Hope BB tool (not included). Once I was done with the install which only took 30 minutes, I spun the cranks without the chain and it seemed to spun for a long time. This BB is so smooth like spinning on nothing at all. I am glad I spent the extra money. I just wish it had came with the tool. This is the only reason for not giving 5 stars. However, I'd do it again. Well, let's kick this off: full disclosure, I haven't ridden the bike with this bottom bracket yet. The wheels are currently being built and it's difficult to hop on the bike in my Park stand and pretend I'm riding because I keep hitting the floor. Ok, serious time. As the other reviewer mentioned, this BB deffo requires the Hope specific bottom bracket tool, HTT188. Since I don't have access to a waterjet, I simply bought the tool from Jenson for a whole $20, which really isn't all that expensive. More fun stuff; I was tossing this BB in my WFO and went Next SL on my MTB to keep the WT DWN. This bottom bracket will play with the Next SL cranks, but it requires a nanny made by Race Face. My bottom bracket shell width is 73 mm, so I required a part number F10010 shim kit. The super secret about that kit is you don't need all three pieces, just a single 2.5 mm shim. So yeah. Hopefully this BB doesn't fail like the 30mm RF Cinch BBs are rumored to do. So, I am wanting to put a bb30 crankset into my threaded bsa 68/73 singlespeed bike. This is the ticket right? BEST ANSWER: Yes they will work, however two things to ensure proper fit. You will need the Hope tool to install and once in your bike make sure the outside measurement of the bearing cups works for crankset you are using. I had to add a 1 mm spacer to non drive side using Race Face atlas crank. Verify that your crank spindle is long enough, the bottom bracket here will solve the spindle diameter problem as long as the crank fits. These are external bearings, I'm running race face turbine. You may need additional spacers as well. It's 96.5mm wide once installed. AS long as the spindle is long enough. That b/b is a work of art but useless if spindle is too short. Also I don't know if Jenson stoxks the special tool to install. I ended up using a strap wrench to install. Worked good cause don't mar anodized finish. Good luck. Yeah, it should work. You will probably need to try different spacer combinations to get the length right. Use shims and a wave washer if the crank doesn't have an adjustment mechanism built in. Angular contact bearings are supposed to be pre-loaded from the side. Yes, that's right. I used this bottom bracket to pair my Santa Cruz Tallboy with a Raceface Next SL Crankset. Highly recommend this bottom bracket. 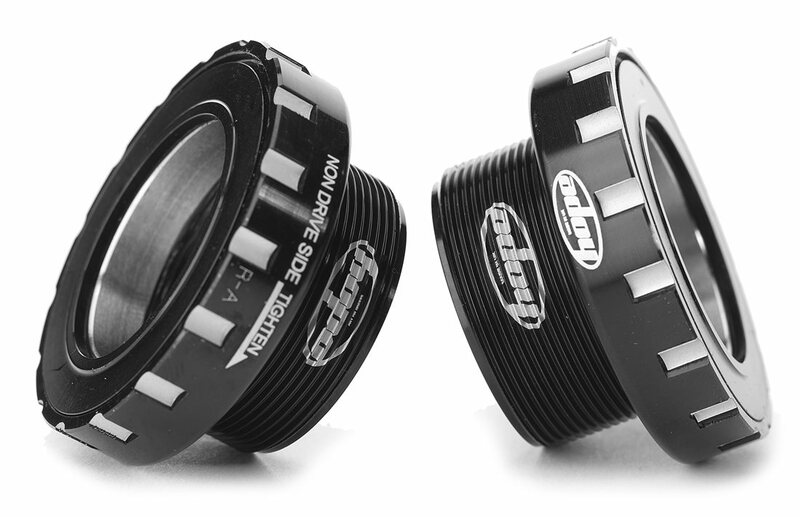 It's a lot higher quality than the Raceface's own BB30 compatible bottom bracket. Yes, this Hope product worked great on my 2011 Turner Sultan. I paired it with a RaceFace Turbine 30mm Cinch Crankset. I also purchased the Hope tool required to install/tighten the bottom bracket. This will work but I didn't find this one to be the best option. I tried a few and found Real World Cycling bottom bracket to work the best. It does depend on your frame though. A couple of other items. You need the wrench to install. And there might be an issue with the spindle length if your crank is not HOPE. Oh, also this BB requires it's own special wrench. So add an extra $20 to the cost. This is what you need. Used them on my SC 5010. Can a race face B.B. tool be used on this? BEST ANSWER: It cannot. You need the hope bb tool. I have both as I tried a race face bb before I switched to the hope bb. No, I had to purchase the Hope BB tool to install it. I Believe so. I used it with a Sram crankset. I had to use a strap wrench to tighten since they didn't have a tool available at the time. Quality piece as all Raceface products. Good luck. No, you need to get the Hope BB tool which is hard to find, Google it..
No. It has to be a Hope BB tool. is this all you need to install Race Face Next R crankset on a 2015 Santa Cruz Nomad with 30mm threaded BB? BEST ANSWER: Yes, the Hope 30mm BB works great with Race Face cranks with 30mm spindles. I've been using one with my Turbine Cinch for 3 years. The only thing you may need is some extra spacers of different thicknesses to take up any extra slack. The Next R has the same preload adjustment collar as the Turbine which is designed to eliminate slack and keep the crank spindle securely in place. The problem with the standard 2.5mm spacers provided by Hope is that one is not enough (the collar can't take up all the extra slack) and using two spacers is too much. So you just need some assortment of 0.5mm and 1.0mm spacers to get it right. Easy once you find the right combination. I ended up with no spacers on the drive side which centered my chain line on the cassette. You'll love the Hope, its way better than the stock RF BB. Mine is still running nice and smooth after 3 seasons. Using a Hope 30mm BB 68-73mm, how well do these match up to that BB ? 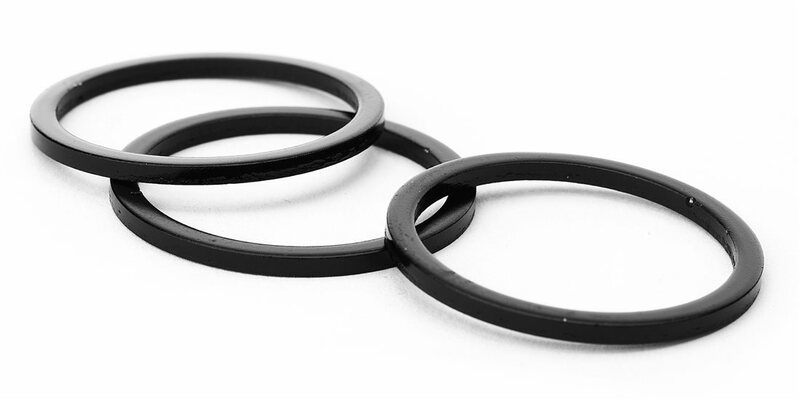 Can these be used with a Campy Over-Torque cranks? BEST ANSWER: To my knowledge they are only supported with the HOPE cranks, but they do have a crank compatibility chart on their website. It seems to me that, as long as all the dimensions match, BB, total width from outside to outside of cups after installation, and the spindle diameter, etc. I'm not sure why they wouldn't. You can also email HOPE. They have great customer response via email. Will this fit with a SRAM FORCE 1 BB30 42 TOOTH CRANKSET? Axle lenght is ok? Cup size? Axle width? Is everything all right. I'm lost with all these non-standard options. BEST ANSWER: No, BB30 is not compatible with threaded external cups. You'll need a BB30 or PF30 frame to run the BB30 cranks. does this come with a sleeve? BEST ANSWER: No. Hope only supplies the parts shown: cups and spacers.